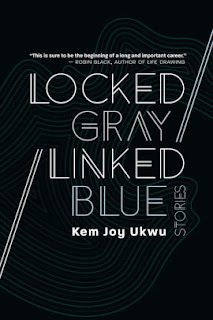 Kem Joy Ukwu is the author of the new story collection Locked Gray / Linked Blue. Her work has appeared in a variety of publications, including PANK and BLACKBERRY: a magazine. She lives in New Jersey. A: "Demetrius" and "Her Mother, Nneka" are connected stories and since "Demetrius" is the first story of the collection, I thought "Her Mother, Nneka" would be a strong end to it - they are like bookends. I decided that the collection's title would be split in half inside the collection to represent two categories in my book. I also decided to assemble the stories into the two categories. Some of the stories are in the "Locked Gray" segment and the remainder of the stories are in the "Linked Blue" part. Q: How was the collection's title chosen, and what does it signify for you? 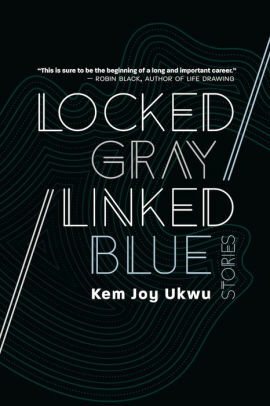 A: I ended up choosing "Locked Gray / Linked Blue" because of the interplay between the words and the meanings of the words as they relate to the collection. "Locked Gray" represents how in relationships (romantic partnerships, family bonds, friendships), people can be locked together. The "lock" - which represents a supposed permanence - can be steeped in uncertainty, which is what the word "Gray" signifies - a kind of ambiguity that the color gray is often used to help describe. "Linked Blue" represents how people can be connected together through links of family and friendship and how these connections can be surrounded by melancholy, which is what the word "Blue" signifies in the title. My collection's stories explore the despondency and doubts of the links and locks of family connections, friendships and romantic attachments. My collection's title represents that. Q: The first and last stories feature the same characters, but the story is told from different perspectives. Did you know you'd write another story about these characters when you started the first one? A: I wrote "Demetrius" first without the idea and the intention to write "Her Mother, Nneka." "Demetrius" existed for years before I wrote its counterpart. "Demetrius" is told from the perspective of the sister who stays in the United States. I was curious about my story after I wrote it - I thought about the sister who leaves, I wondered more and more about her perspective under the surface of her actions and reactions. I knew her viewpoint but I didn't know it - I didn't investigate it until I wrote it in "Her Mother, Nneka." The story is separate from "Demetrius" yet it is also linked to it, similar to characters in my collection - they are connected to each other yet also disconnected. A: I am working on screenplay adaptation of one of my short stories (not from the collection). I'm also working on revising a novel manuscript.